I have spent the past 25 years as a theatre maker, producer, commentator and occasional nuisance. Most of the things I do are simply an attempt to understand the world and my place in it. I am interested in the special and ordinary place of the arts in all our lives and in exploring all of the ways in which people express who they are. As story tellers, potters, knitters, poets and jam makers. The performance work I make is created for spaces other than theatres, concerns the everyday and plays with the relationship between actor and audience. As i have got older I have come to see that there is real pleasure not only in doing things myself, which I do, but from seeing others realise their fullest potential. 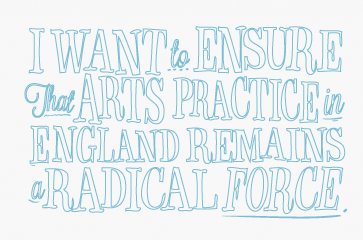 I want to ensure that arts practice in England remains a radical force, that renewal and experiment is not the sole preserve of the cities or the young and that the easy characterisation of the provinces as backward, nostalgic, comfortable places is firmly rebutted. I want to retain my mischief and use the opportunities that come to make a little more sense of the world over the next 25 years.